Yahoo users will be treated to a bunch of new features offering them easier access to their updates on Facebook, with the two web giants' announcing the latest plans in their partnership deal. 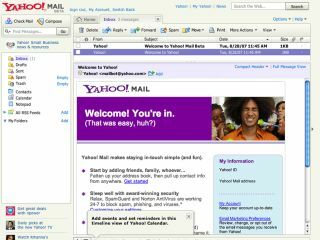 Starting this week, Yahoo users can now opt to have a Facebook newsfeed delivered to their homepage or Yahoo email. The move is clearly an attempt on Yahoo's part to stop its aging, and slightly less 'tech savvy' users spending more of their time online over at Facebook. It will now also be easier to share your information and photos uploaded to various Yahoo sites, such as your holiday snaps on Yahoo's Flickr with your pals and family members on Facebook. The latest moves are part of a wide-ranging partnership deal between Yahoo and Facebook, originally announced back in 2009. Yahoo is also set to rename Yahoo Profiles to Yahoo Pulse and, following Facebook's recent lead, improve the overall privacy features on its sites. Facebook's latest improvements to the privacy settings for its users were seen by many as a response to a recent spate of negative PR surrounding the social networking site's attitudes to data protection.